The Douglas Lighting Controls® Bluetooth® Fixture Controller & Sensor provides automated individual and group control of light fixtures using onboard sensors and Bluetooth technology. The BT-FMS-A installs easily in compatible Universal EVERLINE® Luminaires to immediately provide bi-level occupancy control with no further configuration needed. Additional features may be accessed by deck-level programming using an iOS device and our free Smartphone App. Features include adjustment of the high and low operating levels or conversion to ON/OFF control. An integral daylight sensor may be configured to provided additional energy savings. 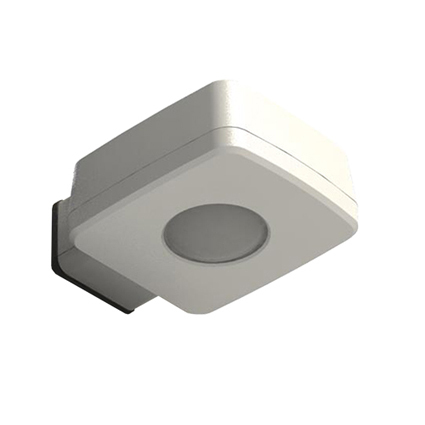 When enabled, this sensor employs 0-10V dimming to make use of natural daylight from opensided parking garages, skylights or windows. Finally, zone control with neighboring luminaires can be achieved using the Bluetooth Smart wireless mesh network. Zone control lights up the place where you are going, not where you’ve been. The Bluetooth® word mark and logos are registered trademarks owned by Bluetooth® SIG, Inc. and any use of such marks by Panasonic is under license.